Is 2013 the Year You Finally Go Mobile With Financial Data? - Laura Sabbagh, CPA, P.C.Laura Sabbagh, CPA, P.C. are – Android is pictured here. While the first two reasons are a matter of personal preference, the third just isn’t true. 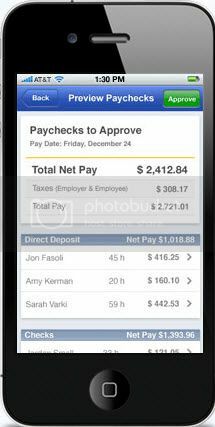 QuickBooks Mobile automatically — and almost instantly — synchronizes the data from your desktop or laptop computer copy for QuickBooks. While it’s only focused on sales, not payables or payroll, you can manage receivables quite nicely whether you’re in a customer’s office or at a trade show or community event — or sitting on the couch at home. Figure 2: You can record sales receipts and payments on your smartphones — even schedule appointments that sync with your Google calendar. – You do a half day of onsite training and your client wants to pay you cash right then to qualify for a discount. You can record the payment and email a sales receipt. – You’re on the road and you want to see how well your bookkeeper is managing receivables. 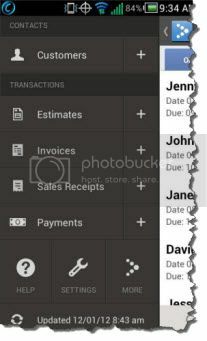 QuickBooks Mobile displays three views: recent activity, today and upcoming. – You’re with a client who would like to give you a check to get current, but he or she can’t find the invoice. Rather than calling your office and sitting on hold until someone has time to look, you can pull up the form on your smartphone to discuss it. If you’ve been in business for very long and still don’t accept credit cards, you have an idea of how many sales you’ve lost. And QuickBooks Mobile won’t let you do so, anyway. You’ll need to get a merchant services account from Intuit Merchant Service for QuickBooks (fees apply). A merchant services account allows you to accept plastic through QuickBooks itself, your web browser, your web storefront — and on your smartphone or iPad. 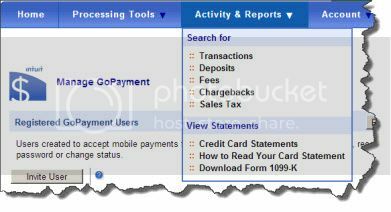 This entry was posted in Accounting, Blog, QuickBooks, QuickBooks Help, QuickBooks Software and tagged cloud computing, mobile, QuickBooks, QuickBooks 2013, QuickBooks Mobile, QuickBooks Payroll. Bookmark the permalink.